As soon as you tell somebody that you are buying a car or that you are going to get your licence you are inundated with tips and tricks for vehicle maintenance. It could be your parents reminding you about the tried-and-true tip to keep your fluids in check. It would be your friends telling you about any vehicle maintenance hacks that they have learned along the way. It could even be a colleague at work who insists on parting all of their knowledge onto everybody who will listen. When it comes time to ask about a basic boat engine, however, it’s mainly a bunch of empty faces. Not because they don’t want to help but because the majority of people have never seen a boat engine up close, let along performed any type of maintenance. If you are looking for a beginner post with some basic information about how your car’s engine and its maintenance differs from that of a basic boat, below is a post from Synthetics Northwest which aims to help. Think back to the last time that you drove your car to the store. Could you hear the engine screaming out in stress? How about when you zipped around the city to complete your chores? Could you hear it then? What about when you were cruising along the freeway? No noise? No. There wasn’t. The reason your engine wasn’t screaming out for help is thanks to its gearbox. This is the part of your car which allows your engine to not only give you torque but also take some reprieve when you reach a solid cruising speed. When you think back to the last time you heard a basic outboard motor then it is likely a different recollection. While you certainly heard the same climbing noise as you do in your car, when you would usually change gears, the outboard’s noise just got louder and louder, until you realized that it wasn’t going to reduce until you stopped. This is because, unlike your car, a basic outboard motor doesn’t have the range of gears to choose from and so it is almost constantly running at a high RPM. This isn’t a fault of the engine or its design. In fact, it has been designed to function in this basic and purposeful way. However, it wasn’t designed to function without a little help from both engine grease and engine oil. While grease takes care of the outside, a high-quality engine oil works to facilitate smooth and efficient engine operation, giving your engine the support it needs to keep you out on the water for longer. Click here to buy AMSOIL 10W-40 Synthetic Marine Engine Oil, a high-quality engine oil designed for marine use. To find out more about its benefits, check out the online store or speak with an expert at Synthetics Northwest by calling (503) 371-7184. Remembering the travels mentioned above, you can likely also remember that there were times where your engine was not only switched off but protected from the elements. For example, an underground parking lot or even your home garage during your errands. Whichever it was, it was protected and given a rest. A boat’s engine, however, isn’t given such treatment. Even while you sit in the shade of your boat, the engine sits outside under the harsh rays of the sun. Whatever temperature is reached is the starting temperature when you switch on the engine, leading it to only get hotter. For this reason it’s extremely important for boat owners to choose the right engine oil for their vessels. 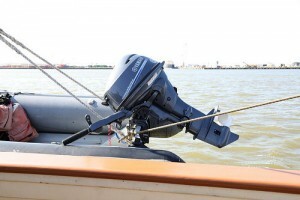 Traditionally, boat owners have relied on conventional oil to get the job done. However, with the rise in outdoor temperatures and the demands of modern engines (even basic ones), conventional oil can no longer handle the task. While your boat's engine may not need a lot of work to be done to it, it does need your attention from time to time. For this reason, be sure to keep your boat and its engine running in good shape with general maintenance and a synthetic oil change. To find the right products for the job, speak with Synthetics Northwest at (888) 283-3580 (Toll Free) and speak about your engine and needs. Of course, as leaders in the field of synthetic motor oil, you can bet that Synthetics Northwest can also help you with any other type of engine or vehicle you have in your garage, so be sure to ask!